As a starting point, can you tell us a bit about how cotton ink was founded? COTTON INK was founded spontaneously by Carline Darjanto and Ria Sarwono (friends since High school). At that time we didn’t have anything to do and try to make some money by selling comfortable cotton garments. What is the concept behind your collection and what makes it different from others? Our concept is ‘casual with a twist’. We offer well-designed garments with good quality of fabric without expensive price tag. It is affordable, wearable for many people. As we all know, the shawl collection is booming after the launching. Actually what inspires you to create the variety of shawls at the very first time? Actually we accidentally found this fabric and think that this is a cute fabric, and make some ideas to wear the fabric. Soon we create many styles to make more interesting, like our “Krey Shawl” which allows you to style it in many different ways. We sell the ideas along with our garments. Why do you decide to not putting a brand label on the shawl piece? Actually we always running out of stock – in order to produce the shawl quicker we decided to omit it – but right now we have the label in the shawl since there are many copies of our products. How is the distribution for your collection besides online shopping? We once made a partnership with some stores but the selling is not so good; perhaps the store itself can’t explain how to style the garments, etc. So right now the focus distribution is only from our blog shop. Do you have a specific target market for the collection? Yep – it is female (currently) – 17-35 years old who loves to experiment in style without sacrificing comfort. Do you have iconic ways to promote the brand? Example, like advertising campaign? We usually make a photo shoot that can capture the mood of the collection. Maybe the photos always attract customers because customer loves to see how the garment falls in female’s body. If you could pick any designer to collaborate, who will it be and why? I don’t have any idea right now. Haha. What do you think about the fashion industry in Indonesia? It is definitely growing but still dominated with same styles, I think it will be cool if we can see more styles and differentiation from one designer to another. Last but not least, what is your future plans for the brand? Grow steadily, step by step, and make a nice little store one day. And hopefully we also can reach more international customers. And dont forget to drop by Cotton Ink booth at Brightspot Market @ Pacific Place,Jakarta from March 11-14 2010. You guys are so creative. I love the red double shawl. yeah can't wait for the brightspot dear~ btw kamu dateng gx? what a coool interview c fhen! great great great post, fhen!! love the idea of interviewing local brand!!! love the pics. youre really good at styling and photographing. mau dong di foto pas kamu pulang! hahahaha.. The structured shredding is really interesting. Great interview! love your photo shoot too! very stunning post fhen ! love it. i love cotton ink damn much ! can't wait to go to bsm later. hihi. who doesn't love cotton ink ? hey thanks for following my blog. i've followed you back. anyway, great post. love the interview with COTTON INK. hey, nice blog yaaa, wanna exchangelink ? :) reply in my post comment . i've followed you. thank's for folllowing me first. i love your blog. talking of Cotton ink. this is my fave Shawl brand. i've purchased one. Oh, the infinity scarf looks epic! Love it!! I loved learning more about this brand. I will definitely have to check it out! love that brand! saw it on several people already.. beautiful!! I like the scarf piece a lot! so cool! do you know if they ship to the US? Wow wow wow! These clothes are wonderful! Great interview, lovely! mom ga mau di lucky, katanya yg biasa stay di sana kebanyakan yg berobat, takutnya kenapa2. cci di sana sekitar 6 hari. we must meet up! Such a great interview! Thanks for posting this! These clothes are absolutely stunning! i love the slits and shreds in the top. so chic. great photography! how cool is this brand! 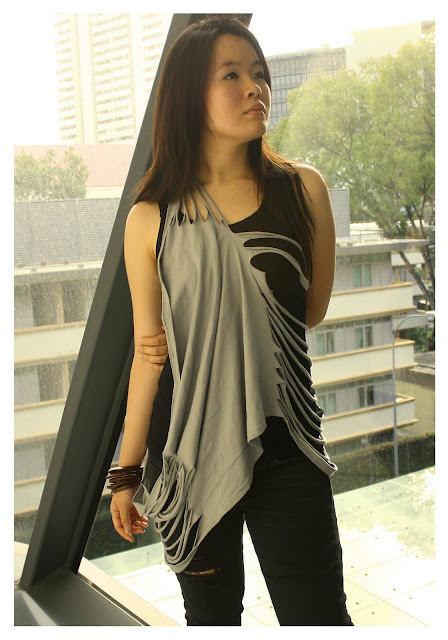 i love the idea of simply wearing the piece as a shawl...very stylish! Wow, it's a nice words, okay! i will follow youuuuu.. :) thanks for a sweet comments! Great post dear!!! !These clothes are amazing! and cute interview! I LOVE those shredded tops! Gorgeous! & so creative. Great interview & love the shredding! I'm quite diggin' that infinity scarf. Fabulous feature! I really am in awe at these scarves-- it's so edgy but put-together at the same time. wow, amazing! shredded tops! yum! Great interview and photos! I love these pieces, especially the deconstructed shredded pieces. Very cool! Congrats on the interview, Sweetie! I love that shredded top on you. So versatile! I love that shawl and I'm not even in the 17-35 age range! It is really versatile and I could see myself wearing it in a number of ways. yeah, i hope i can meet u too . we go to smpk7 penabur, ever heard? Fhen dear, I am great, what about you? I missed hearing from you, but I can tell you've been doing great! interview well done! and those are some really cool scarfs!!! i want!! i want the alexander wang knit version. its quite unbelievable. I love the way it plays with such a classic t shirt material to make such cool shapes. Ooh! Great interview. It's interesting to gain perspective from inside the industry. The scarves are supppaa cool too! Great interview, and the scarf is ingenious! coool!you comin to bright spot? that shawl is so cool!! What great interview! Love all the scarfs and shawls! Lovely interview, that infinity scarf is pretty fantastic! Wow, love it! The shreds are awesome. cotton ink is uber cool, we all love it !!! >>check out my latest post here ! awesome interview. love that infinity scarf!